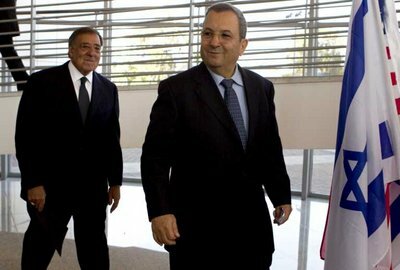 Tel Aviv, Israel - Israel must find a way to resume negotiations with the Palestinians and has a responsibility to try to ease tensions with its neighbors in the region, Israeli Defense Minister Ehud Barak said Monday amid prodding from the United States to return to peace talks. Standing next to Defense Secretary Leon Panetta, Barak pushed back a bit on the Pentagon chief’s warning that Israel is becoming increasingly isolated in the region, threatening its security. And he offered no new thoughts on the thorny issues that have stymied the peace talks, including the proposed timetable and the contested settlements in the West Bank and East Jerusalem. Making his first trip to Israel as defense secretary, Panetta has pressed the Obama administration’s view that the two sides must restart the long-stalled peace talks. And during a news conference with Barak, Panetta said it’s time for bold action by both sides to move toward a negotiated two-state solution. The visit comes amid new international pressure to reach a peace deal by the end of next year, fueled by Palestinian President Mahmoud Abbas’ move two weeks ago asking the U.N. Security Council to recognize an independent Palestinian state in the West Bank, east Jerusalem and Gaza Strip. Those areas were captured by Israel in the 1967 Mideast war. The administration opposes the Abbas’ U.N. bid, and Panetta’s visit was clearly part of a broad campaign to avoid such a vote, and instead nudge the two sides back to the table. On Sunday, Panetta issued his edgy warning that Israel risks eroding its own security if it does not reach out to its neighbors, such as Turkey and Egypt, where relations are eroding. “It’s pretty clear that at this dramatic time in the Middle East, when there have been so many changes, that it is not a good situation for Israel to become increasingly isolated. And that’s what’s happening,” he said. Barak offered only general agreement but made no commitments that Israel would be more receptive to discussions about the settlements. Israel has continued to build settlements in the West Bank and east Jerusalem, where some 500,000 Jewish settlers now live. Israel withdrew from Gaza in 2005. Panetta met Monday with Barak in Tel Aviv on the first leg of a Middle East trip, and then he traveled to the West Bank for a meeting with Abbas. There were no public remarks by the leaders after the meeting. But senior Palestinian official Saeb Erekat, said that during Panetta’s meeting with Abbas, the Pentagon chief said that the Quarter provides a good foundation for resuming talks. “President Abbas appreciated the commitment and said we stand ready to resume negotiations, on the basis of the recent Quartet statement, provided Israel carries out what it is asked for in the statement, i.e. a settlement freeze and accepting” a two-state solution on the 1967 lines. Palestinian officials said privately they believe the Panetta visit was largely meant to show that despite differences of opinion, the U.S. cares about and wants to maintain the relationship with the Palestinians. Panetta is also scheduled to meet with Egyptian leaders, and later in the week, he will head to Brussels for a meeting of NATO defense ministers, to talk about the Afghanistan war and the military mission in Libya. Panetta’s visit to Israel comes six months after his predecessor, Robert Gates, traveled to the region to meet with Israeli leaders and make the first journey by a Pentagon chief to the West Bank to talk with Palestinian Prime Minister Salam Fayyad. You are just another hopeless emissary of the White House to bring about the miracle of peace in the Middle East. I can't believe there are so many who tried and failed if it was really possible. Let's step back and give this another angle. History shows Israel making countless concessions to the barbaric savages that are dedicated to remove her from the map. The more they concede, the more murder, terror, and "isolation" is heaped on her. Are you among those who are evil, immoral, or stupid enough to accept Muslim pre-conditions but to deny israel the only rational one - the abandonment of terror? Israel does not need your "New Year" wishes. It needs your "new approach" wishes. Put some heat on the animals who lie, teach their children the ways of terror, who rewrite history, misappropriate foreign aid from humanitarian to terror support, who abrogated every treaty they ever signed.Try, for once, to put pressure there, not on Israel. Make the United States government adopt a zero tolerance for terror. Yes, zero. Yes, GW Bush's Axis of Evil. Zero tolerance. No aid of any kind. Get off Israel's back.